Flyaway Facilities - Timeline Television Ltd.
Timeline specialise in providing flyaway facilities for use in situations where an OB truck cannot be deployed. These flyaway systems offer cost effective solutions to television production. 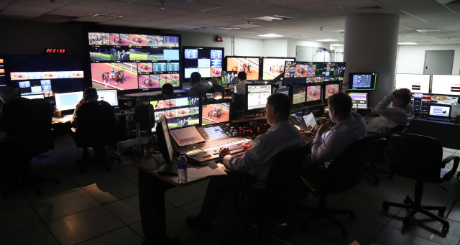 By thinking laterally and using advances in technology we have achieved significant cost savings without ever compromising on the two most important factors in any outside broadcast: production quality and reliability. Our flyaway kits are fully modular and can provide solutions from a simple 3 camera operation to large broadcast events. They have been deployed on projects as diverse as the Henley Royal Regatta, Worldwide sailing events and Stargazing live where the kit was deployed in the Faroe Islands to provide BBC One live coverage. Our experienced team of Broadcast Engineering Managers will work with you to tailor our flyaway kits to ensure we deliver a high-spec solution at an industry beating price.